Here's just a quick look at some surname tools that are interesting from a family history perspective, but truth be told, they're mostly just fun. The Top Ten Surnames. 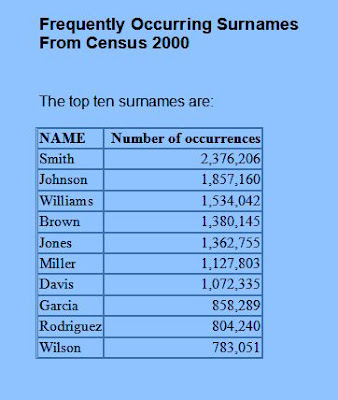 Smith leads the way, showing up 2,376,206 times in the 2000 Census. The full Top Ten list is right here. The list of the Top 1000 Names can be downloaded from the Census site. So can another ranking list with 151,671 surnames that occurred 100 times or more in the 2000 Census (the list is configured to fit in a standard spreadsheet). There are similar lists of rankings of first names from the 1990 Census. There's also an interesting (albeit technical) paper on the challenges of counting Hispanic surnames, with a list in the Appendix of the Most Common "Heavily Hispanic" Surnames. There are other good surname tools out there. Name Facts, at Whitepages.com, provides stats even on really rare names (like mine, which doesn't show up on the Census lists). It even shows a map of geographical distributions for your family name. The Social Security Death Index is another good, quick way to gauge the popularity or rarity of a particular name. Enter just a last name (or just a first name, for that matter) and see how many results turn up. I like having an unusual last name. It makes family history research so much easier...almost everything that I find is actually related to my ancestors in one way or another. If my last name was Smith, on the other hand...Hoo Boy! Talk about too much of a good thing! Ken...put a link here in comments. I'll be sure to have a look. Thanks Jennifer...it should be OK now.